There’s a reason we like to have our favorite things around us - why our drink tastes better when we use our special mug, or we’re more relaxed when we sit in a particular chair. These are the things that ground us, that comfort and calm us. A familiar environment allows us to quickly ‘get in the zone’. And this is what setting a sacred space will do for you. By creating a sacred space, you are creating the right environment for you to do your ‘you work’ - all of that spiritual growth: meditation, yoga, journaling, even reading a book. What’s the difference between sacred space and an altar? An altar is an area that we set up similar to sacred space, but it also has very specific healing tones to it. On an altar, we can have religious items. We can set up crystals, we can have prayer cards, place our journal. The altar is our place where we're going to honor the work that we're doing. 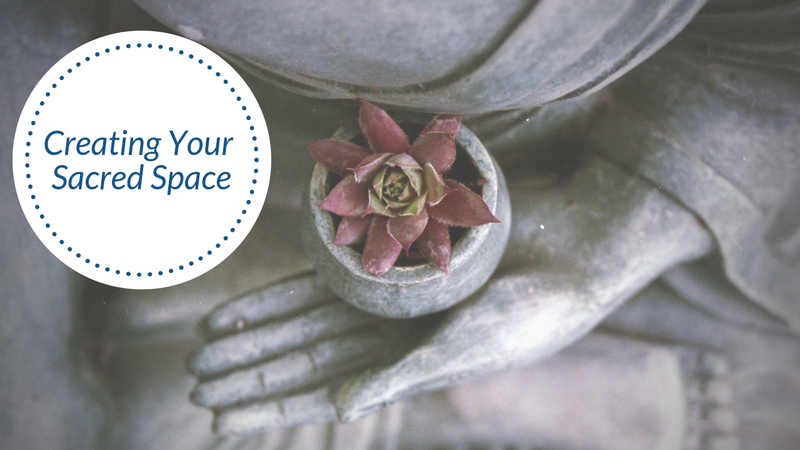 What are the benefits of creating a sacred space? Whether you create a sacred space or an altar, your prayer and your intention is what's going to keep it all in that highest vibration or alignment. Whether you’re doing yoga, meditating, praying, writing, or artwork, the act of setting a sacred space creates a tone of love for yourself to grow and evolve with the Divine. The other great thing about setting up sacred space is that it's there for you whenever you're ready. It reduces your stress and worrying that you don't have time to meditate, for example, and reminds you to carry out your daily practice. It’s about giving yourself the love that you've always wanted. Your sacred space is waiting for you. In the video below, I share how I build my sacred space and how you can use your sacred space. I'd love to hear from you if you're able to create this beautiful, sacred space in your home - what you include and how you’re using it. Share your experiences with me in the comments section below the video and why not take a photo of your sacred space and post it in the Angels Don’t Lie Facebook group to give others inspiration?